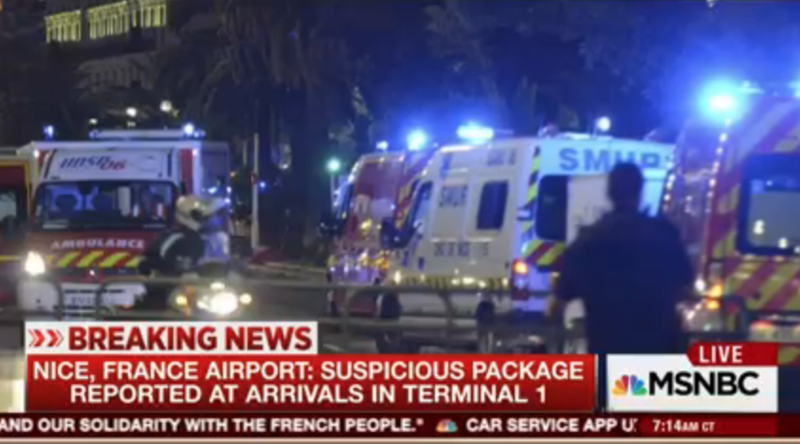 An NBC News crew is among the journalists and travelers evacuated from the airport in Nice, France Friday after a suspicious package was found. France remains under high alert following the truck attack in Nice that left more than 80 people–including two Americans–dead. Jesse Rodriguez, a senior producer for MSNBC’s Morning Joe, said via Twitter “Nice airport confirms there is a suspicious package reported at arrivals in Terminal 1; bomb squad being called.” An Associated Press crew is also among the evacuees. Troops have rushed to the airport after passengers were ordered to leave the baggage collection area. Soldiers are now sweeping through the airport while confused passengers have been ordered to wait outside.